Julius Mays’ life changed in his one season at Kentucky. It happens for most that wear the blue and white for John Calipari, but Mays’ experience was a little different. NBA stardom did not change Mays’ life; being a father did. Ahead of Father’s Day, CoachCal.com is publishing a series dedicated to fatherhood to show what it means to the players, coaches and their families. Before the Calipari kids get a crack at it, Mays penned an emotional piece that shares a side of his story you probably have not heard. A graduate transfer from Wright State ahead of the 2012-13 season, his recruiting process revolved around his soon-to-be-born daughter. Every staff told me they were committed to helping me be the best player I could be, but I was looking for a place that was also committed to allowing me to be the best father I could be. I wanted to make sure the coaches knew my priorities and would be fine with me being right there when my daughter was born, even if it meant I had to miss something with the team. At Kentucky, they made it clear that they were willing to do everything they could to help me reach my goals on and off the court. I could not have surrounded myself with a better group of people at that time in my life and I’m still thankful for all of the support and advice they gave me. Seriously, if you’re having a daughter, Coach Robic has A LOT of advice for you. 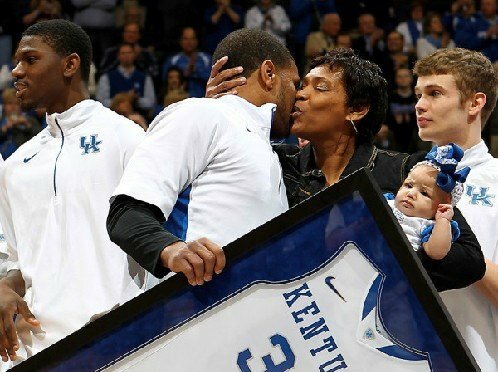 Mays was able to juggle life as a dad and a basketball player for one season at Kentucky. He averaged 9.3 ppg and shot 37% from behind the three-point line. However, he could not do both at the professional level. After stepping away from basketball, he lives in Indiana with his wife and two daughters. When reflecting upon his time at Kentucky, Mays has no regrets. The screaming of 24,000 people at Rupp Arena is an indescribable feeling, but walking in the door after work and hearing my youngest daughter yell “Daddy!” and then hearing about my oldest daughter’s day blows that out of the water. I went to Kentucky to fulfill my dreams and that’s exactly what I did. That’s awesome and I’m very happy for Julius! He seems like one helluva man and father. Julius May is a classy man. Best of luck in life kid. Jesus…you all act like Julius mays won 3 championships at Kentucky. Never mentioned players like kelena or Gerald Fitch. Get over him, he’s not a legend.